Donatello is being questioned by the government authorities that believe the Turtle is an alien (due to his armor and the modified Triceraton aircar). The Feds try to call the Savage Dragon in to identify Don, but the fin-headed cop has gone missing – so some other super heroes from Chicago have come to check out the Turtle via a two-way mirror, but none of them recognize Donny. The man questioning Donatello tells him that he cannot leave until they find someone who can speak on his behalf. When informed of this news, Donatello gets upset and yells at the government agent. Don’s actions alarm the heroes who have come to indentify him and they break through the mirror prepared for battle – fortunately, Horridus arrives and she recognizes the ninja before any more violence breaks out. Casey Jones ends up on the news claiming to be the killer of the giant komodo dragons from the previous issue. April gets a call from Casey’s boss, who fires Jones for blowing off work to hunt for the giant lizards. April gets upset and leaves the room crying. Master Splinter tells Shadow she should go to April and give her hugs, as her surrogate mother needs them badly right now. Raphael, still garbed in Shredder’s armor, tells his Sensei that he makes a better grandfather than a father, and Splinter agrees, noting that he’s failed to teach Raphael the lessons he tried to imbed in him. 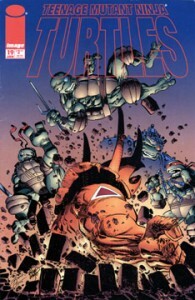 Raph asks Splinter for help with the Foot, to mold the organization into his image, but the aged mutant refuses to help those who were once his bitter enemies, and notes that the image Raphael is ruling them with is that of his arch foe, the Shredder. Master Splinter asks Raph what he intends to do about the Japanese branch of the Foot Clan, and the Turtle replies that he’s been trying to contact them to no avail – but he’s not worried about it since they have a truce with Karai. Raph prepares to leave and snarls that Splinter would help if Leo asked him, and the Sensei states that Leonardo has already asked and he got the same answer – the Foot should have been left to die off. Mike and Leo accompany Leatherhead back to his lair and are surprised to discover the giant gator mutant has built yet another transmat – even more shocking is the discovery of an Utrom named Dr. X! The alien had been injured back when the Utroms T.C.R.I. building exploded (TMNT Volume One #7) and Leatherhead had found him and nursed him back to health. Dr. X has been helping LH make the new teleportal device – but the same problems as before have arisen (TMNT Volume One #45) – Leatherhead’s hands are too large and clumsy to allow him to make the fine adjustments necessary to complete the machine. Thus Mike and Leo help LH and Dr. X finish off the transmat. As Leo works on the mechanism itself, Mike follows Dr. X’s orders while working on the computer console. After a time, the Utrom instructs the Turtle to push a certain button – which activates the device and teleports Leonardo away! Mike admonishes the Utrom, who states he couldn’t test the machine on Leatherhead or himself and then tells the ninja not to worry, giving him the button combination to bring Leo back. Unfortunately when Michealangelo programs Leo’s return, he arrives with a Triceraton warrior in tow! A battle breaks out between the old foes. Dr. X notes that they must hurry and defeat the saurian warrior before his people trace the signal from his teleportal machine and send reinforcements. Right on cue, two more groups of Triceratons port in. Leo grabs a blaster and shoots the transmat (much ot the Utrom’s dismay) to prevent any more enemies from gating through and our heroes make their escape via the sewer waters. The Triceratons lock onto a signal identified as Zog (from TMNT Volume One #19). Hoping that Zog is still alive and has built a base on this world, the Triceratons teleport one of their warriors to the source of the signal – none other than the aircar that Donatello and Horridus are currently in!